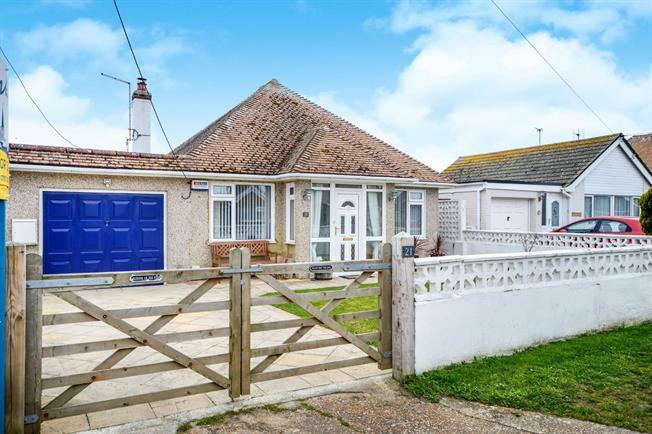 3 Bedroom Detached Bungalow For Sale in Romney Marsh for Guide Price £325,000. Guide Price 325,000 - 350,000 Well presented three bedroom detached bungalow with conservatory, garage and off road parking with no onward chain. Entrance porch to the front leading to the hallway. The lounge has a wood burning stove set in fireplace, opening into the dining room which has French doors to the conservatory which overlooks the rear garden. Three bedrooms. Luxury bathroom comprising bath, shower cubicle, wash hand basin, WC and complimentary tiling. Off road parking to the front leading to the garage with up and over door. The rear garden is mainly laid to lawn with flower borders, patio and fenced surrounds.